Davenport, Iowa - I guess you could say that this story started last year or 40 years ago. It’s a love story and has to do with the soft spot I have in my heart for the half mile dirt track. Since last year is a lot closer and my mind is sharper for the most recent I’ll go back one year to my first trip to Hartford (Michigan) Motor Speedway. It was a Lucas Oil Dirt Late Model Series show and the old speed plant was all gussied up for the traveling series. It was a bright sunny day and I was happy. I was gleaming with excitement as the guys took to the track and my friend Jim Den Hamer asked why I was so happy. I said because I was at a BIG half mile and I loved the place. Jim said something like. “You Iowa guys and your half miles,” and we both went back to taking pictures. It’s hard for me not to like half miles. There are 99 counties in Iowa and all have a County Fair. At one time when horse power was truly a horse with power almost all featured horse racing and most of the tracks were half miles. After the WWI years many of those tracks converted to Internal Combustion Horse Power and again many remained as half miles. Most of the tracks I went to as a youngster were half miles. It’s what I was raised on and yes I still like half miles. To me there is nothing like watching a Hot Rod V-8 race car scream down a long straightaway and fly through a sweeping turn and drag race down to the next corner. It takes horse power, handling and nerves of steel to go as fast as you can for as long as you can. 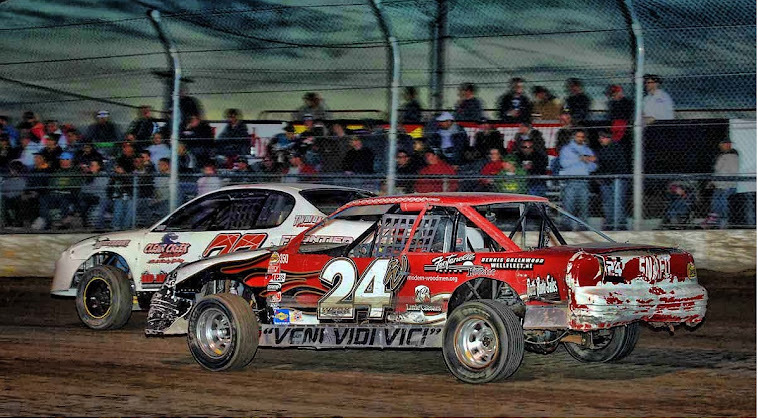 It’s not always side by side racing like you see on a short track, it’s different and I love it! One minute the car is right in front of you and the next it is so far away. There once was a day when one of the best half mile tracks in all of Iowa was in my home town of Davenport. The grand track started as a one mile in 1904 and later when the Mississippi Valley Fair Grounds was born in 1920, it was shortened to half. It was a marvel as crowds of over 60,000 would pack the grounds to watch the racing of the day. Big cars, Sprint cars, Midgets and Stock cars were the rave on the half mile. Through the 1920’s, 30’s, 40’s, 50’s, 60’s, 70’s, it stood the test of time. Not till 1982 and the construction of the quarter mile did the grand big track see competition becoming a special event only attraction and going into dusty slumber. The move to smaller tracks is nothing new, just as there are few one mile dirt tracks left today, there will be a time when there are few half mile tracks. There are just fewer weekly racing programs on half miles as fair boards and promoters look to downsize cost and provide more side by side racing that sits right in front of the fans. It’s almost inevitable when a small track is built inside the half mile that before long the big track goes idle. It’s as if the low budget slow cars rule the roost thus carving out the half mile traditions. Needless to say, I truly enjoy my opportunities to see racing on half miles. West Liberty, Knoxville, I-80, Adams County, Oskaloosa, Webster City, Columbus Junction, Des Moines, Cresco and Farley are special places to me. They help me remember my shuttered friends like Freeport, Hawkeye Downs, Granite City, Knox County and Santa Fe. This is not to say I don’t like smaller tracks, I do! The biggest difference is that half miles take me back home and my hometown track the Davenport Speedway half-mile. I grew up in Davenport and at Davenport Speedway. It was the early 1970’s and I was a Ronnie Weedon fan. Watching “Old Blue” cruise the track was my Friday night ritual. I then returned home in the 1980’s to see the Busch All Star Tour resurrect the big track and witness Steve Kosiski dominate show after show. As the All Star’s dimmed we had “Open Late Model Shootouts” and then later the WDRL. Davenport was special again but nothing was more special than the 2000’s and the great run of Hav-A-Tamp, UDTRA and Lucas Oil dirt late model events. These yearly events brought the biggest, best cars and drivers to the famed oval. The Hav-A-Tampa years were a hit after hit and before long other tracks wanted what Davenport had. As time went on the luster went dull, the magic gone as the racing market became saturated and stuffed out the cigar aroma. The WDRL with Jim Wilson at the helm did a great job of keeping big shows on the half mile with annual stops but that world ended too in 2009 with Chad Simpson winning the April open motor event. Over the next few years the track lay crumbled and worn serving as a launching pad while the smaller track laughed at her dust. It was not until September 2011 and then again in 2012 that the Grand Lady showed her stuff with exciting IMCA Deery Brothers Summer Series action. Just maybe she still had something left in her to excite the fans and return her to glory. This takes me to last week’s Corn Belt Clash race. With local open motor cars dwindling or off to greener pay windows the event pulled in enough good Hot Rods to show what the track still has. Davenport Speedway has a way of making stars shine over the years since the Best of Best have raced there. The star this night was Jason Feger. The Illinois “Highside Hustler” did just that and hustled the track looking like he has raced half miles all his life even though he has not. It was marvelous to watch. It proved to me and all that the Big Half Mile still had what takes to make a great race. So here we are now and the dirt is settling to dust once again, churning to be graded, watered and packed for racing. We will wait until the September Song before she roars once again. I will hit the road and see many races on tracks of all sizes, all while wanting and thinking that I’d like to be a Half Mile from Home.